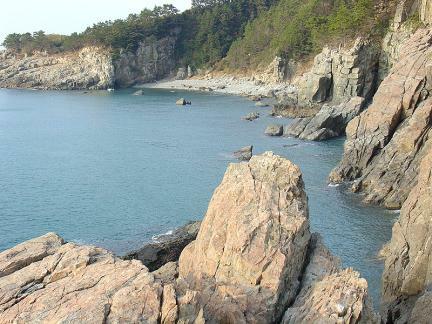 ＂다랑이 논＂은 선조들이 산간지역에서 벼농사를 짓기 위해 산비탈을 깎아 만든 인간의 삶과 자연이 조화를 이루어 형성된 곳으로 ＂가천마을 다랑이 논＂은 설흘산과 응봉산 아래 바다를 향한 산비탈 급경사지에 곡선형태의 100여 층의 논이 계단식으로 조성되어 있으며 배후의 높은 산과 전면의 넓게 트인 바다가 조화를 이루어 빼어난 농촌문화경관을 형성하고 있어 경관적(예술적) 가치가 뛰어나다. 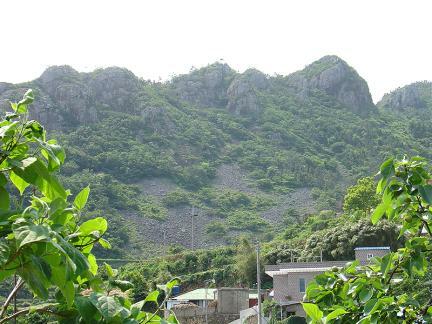 가천마을의 유래에 대한 자세한 자료는 없으나 대대로 마을에서 살아온 김해 김씨, 함안 조씨 가(家)에 전해오는 자료로 미루어 볼 때 신라 신문왕 당시로 추정되어지고 있으며, 미륵전설과 육조문에 대한 전설이 고려시대 이전에 삶이 시작되었고, 400여년 전에 일어난 임진왜란 시 사용된 것으로 추측되는 설흘산 봉수대(烽燧臺)는 이미 그 전에 이곳 가천마을에 집단적으로 거주했다는 사실을 증명하고 있다. 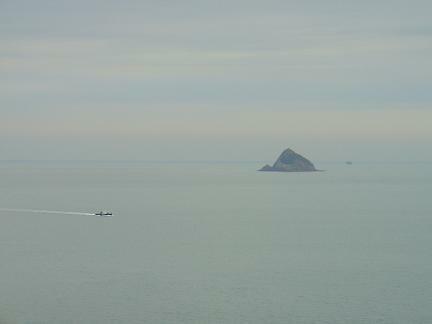 전해오는 마을의 옛 이름은 간천(間川)이라 불리어 왔으나 조선 중엽에 이르러 가천(加川)이라고 고쳐 현재에 이르고 있다. 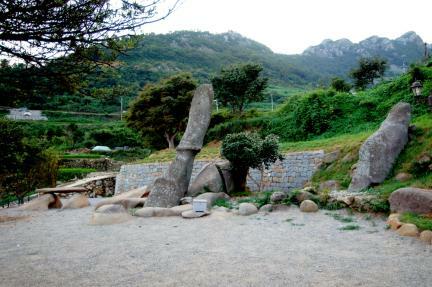 2002년 농촌진흥청 농촌전통테마마을로 지정되었다. 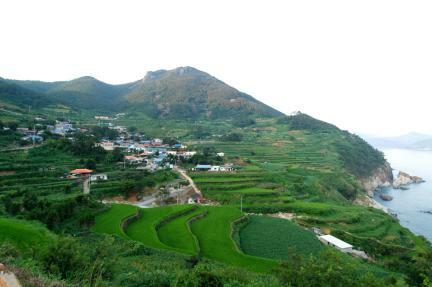 논, 산림 및 바다의 자연적 요소와 가천암수바위, 밥무덤, 설흘산 봉수대, 서포 김만중의 유배지인 노도(섬)와 같은 문화적 요소는 명승적 가치를 한층 높이고 있다. 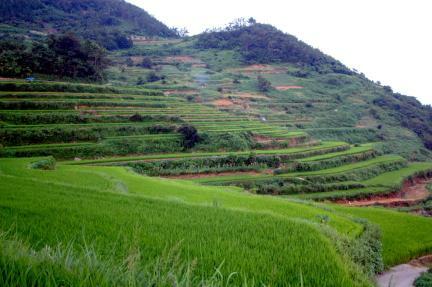 Daranginon is the name given to the terraced rice fields created on a mountain slope to cultivate rice. 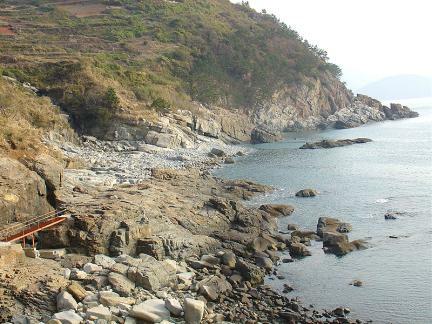 It is a famous spot showing an aspect of human life in harmony with nature. 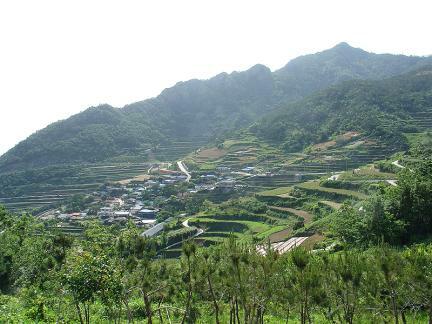 The fields in Gacheon Village, Namhae cover steeply sloping land at the foot of Seolheulsan Mountain and Eungbongsan Mountain and consist of 100 curving terraces. 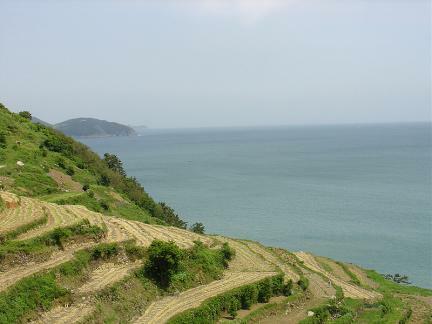 The high mountains in the back and the wide open sea in the front combine to create spectacularly beautiful rural scenery. 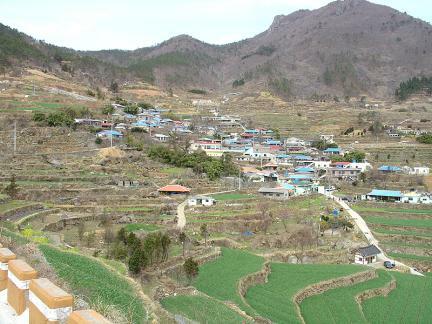 There are no exact records on the origin of Gacheon Village; according to materials on the Gimhae Kim Clan and Haman Jo Clan, who have lived here from generation to generation, however, it is estimated to date back to the time of King Sinmun of Silla. 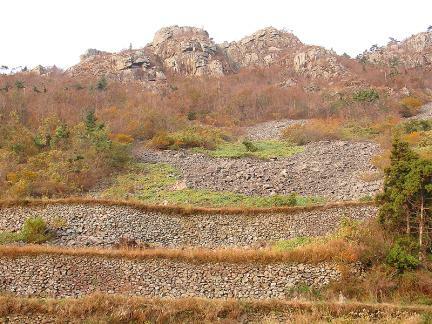 There is also a story of Maitreya believed to be responsible for the rice cultivation, with the six rocks at the foot of the mountains marking the spots where six Buddhas attained salvation; thus indicating that life here began before the Goryeo Dynasty. 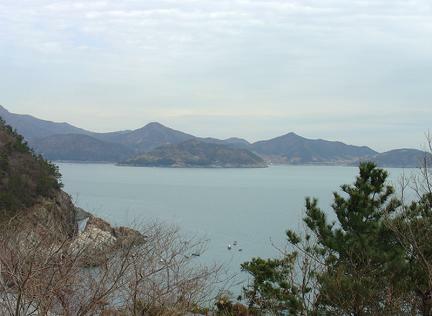 In addition, the beacon mound on Seolheulsan Mountain -- supposedly used during the Japanese Invasion of Korea in 1592 -- shows that there was a large settlement here at least before that time. 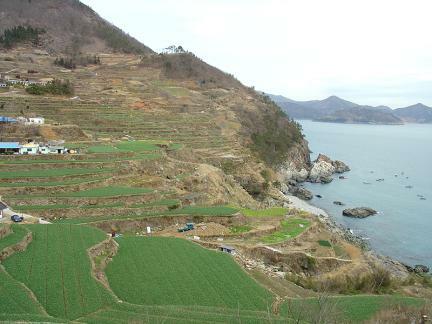 The village was originally called Gancheon but renamed Gacheon in the mid-Joseon Dynasty. 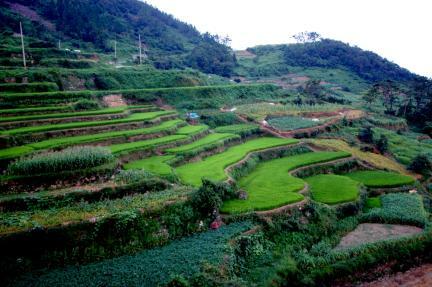 In 2002, the Rural Development Administration designated Gacheon as a traditional rural theme village. 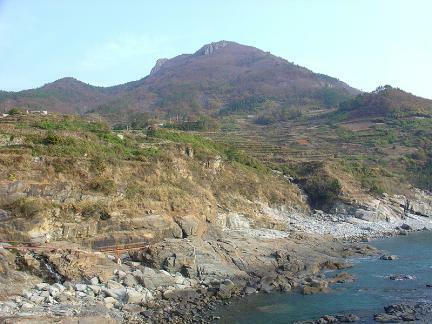 The natural scenery of forests, fields, and sea along with cultural features such as Gacheon Amsubawi Rock, which refers to two rocks -- male and female -- that were believed to drive away misfortune, Bammudeom (Rice Tomb), Seolheulsan Beacon Fire Station, and Nodo Island where Kim Man-jung was exiled make this area a famous scenic spot.